Many in the Chaldean Christian community of the Detroit metro area reportedly voted for Donald Trump with the belief that he would keep them safe. 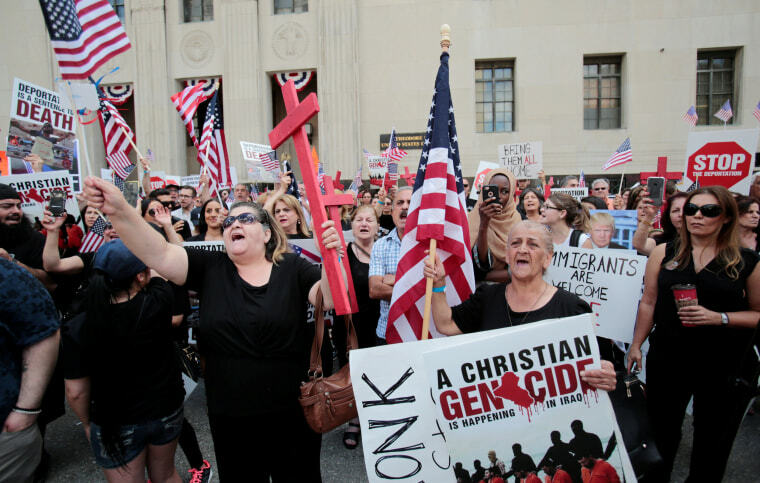 Now the Iraqi religious minority group in Michigan is facing mass deportations, which means being forcibly returned to Iraq, where they fear their faith endangers them. “Trump won off our backs. So there is a great sense of betrayal and anger in the community,” said Wisam Naoum, a Detroit lawyer and Chaldean community leader. U.S. District Judge Mark Goldsmith ruled Monday night in favor of a two week stay of removal for Iraqi nationals. The decision will prevent the deportations of at least 114 Iraqis from Detroit who are hoping to reopen their immigration cases, The Washington Post reported. Goldsmith's ruling impacts Iraqi nationals nationwide. A decision has yet to be made on whether the U.S. District Court for the Eastern District of Michigan, where Goldsmith serves, has jurisdiction to rule on the class-action lawsuit filed by the American Civil Liberties Union to protect the estimated 1,444 Iraqis across the nation that the U.S. Immigration and Customs Enforcement said it plans to deport. The Chaldean Christian community in Sterling Heights, Michigan, represents the largest concentration of the religious minority outside of Iraq, according to the Chaldean Community Foundation. Chaldean Christians speak Aramaic and are Eastern Rite Catholic, which means they are connected to the Roman Catholic Church. Naoum said those in Michigan are generally Republican and supported President Trump by attending his rallies, holding fundraisers and having a Chaldean priest bless him during his campaign trail. Nadine Yousif Kalasho, an attorney from Code Legal Aid who is partnering with the ACLU in their lawsuit, said that community members typically don’t vote but did so in the past election to support Trump. “The vote was like a 10,000 vote difference or something and I’m pretty sure this community is why Trump won,” she said, adding that the community was in shock when the raids occurred. Naoum said the Iraqi nationals thought Trump was the best option to keep them safe since he has spoken about protecting Christians in foreign countries. Kalasho said that members of the community feel taken advantage of by the president. “They believed him and took him for his word and he totally went against that,” she said. On June 11, Edward Bajoka, an attorney who is representing 15 Iraqi nationals in their personal lawsuits, said he was on the golf course when his phone kept ringing. “I was getting calls from people who were frantic saying their loved ones were just taken. That ICE was at their door,” Bajoka said. “It was heartbreaking.” It was obvious that the Iraqi community in Detroit was being targeted, he said. The people seized by ICE had been previously ordered to leave the country for having committed crimes. Bajoka said all of his clients at some point possessed green cards but were stripped of them when convicted of a crime. While he admits some of them committed very serious offenses, he said a majority of the Iraqi nationals were involved in low level felonies, misdemeanors, drug offenses and other non-violent crimes that they served time for. Bajoka said the removal of these Iraqi nationals violates the Immigration and Nationality Act and the Convention Against Torture, which prevent aliens from being sent to a place where their lives will be threatened or they will be tortured. Bajoka’s clients have also stressed they will be sent to unfamiliar territory. Two of his clients were born outside of that country to Iraqi parents but are considered Iraqi citizens. “So the government is actually seeking to deport people who have never stepped foot on Iraqi soil,” Bajoka said. Although their green cards were taken away, the Iraqi nationals were not deported because the Iraqi government previously did not accept them. They have been under supervision by ICE for decades with the understanding that they just had to report to immigration when told and not engage in illegal activity. But things changed when Trump issued another travel ban in March — it included the stipulation that Iraq would have to accept deportations from the U.S. in order to be exempted from the ban overall. Now, those who have been detained for deportation have been taken from the Detroit area to Youngstown, Ohio, as well as to Arizona and Louisiana, said Kalasho. That means she can only communicate with them via family members. A majority of the Chaldean Christian community has lost confidence that Trump administration will stop Iraqis from being deported, according to Naoum. If the nationals are awarded new cases and allowed to stay in the U.S., they would be required to report to immigration at least once a year and be monitored, Bajoka said. For the ACLU case, Kalasho said that even if the judge does not have jurisdiction to hear it she will continue to make sure every detainee can meet with a consultant and have their voices heard. CORRECTION (June 28, 2017, 4:10 p.m.): An earlier version of this article misidentified the city where detainees from Detroit are being sent. It is Youngstown, Ohio, not Youngstown, Arizona. In addition, some detainees are being taken to Arizona and Louisiana.